"DEVELOPING YOUR OWN SCRIPT" - Ένας καλλιτεχνικός διάλογος με τον Charon Kransen. Charon Kransen’s master class “developing your own script” is based on the concept of encouraging jewelry artists to work from their unique talent instead of relying on the more common route of commercial work that is often dictated by main-stream demand/taste. This involves insight in the often psychological and emotional barriers we consciously or unconsciously have put up within ourselves. His premise is that most artists are ill prepared in matters relating to professional life in their relationship with galleries, dealers and clients. The seminar focuses on issues of: identity, recognition, success, clients, collectors,” the market”, ethics, presentation and galleries. To that end, he directs discussion around central themes of dealing with how galleries work, what their motives are, how they select work, how they develop a vision, and how the artΕs develops contacts with the gallery, with the client and with the dealer. How to have a good relationship with this population and discuss issues freely? How to solve problems as they arise and learn how to deal with them and/or avoid them? How to develop skills to have a more satisfying, creative and rewarding (also financial) professional life? How to focus attention on questions such as “where would I like to be in the field”. How to be part of an international marketplace. The 3- day seminar has received critical acclaim for its inspiring and empowering discussions and career development. 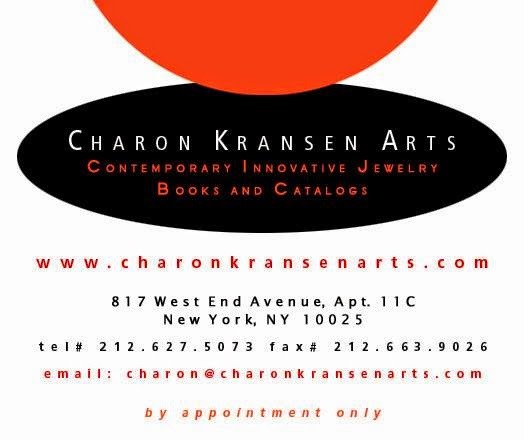 Charon Kransen ( b. Holland 1950, resides in New York City) has worked in the field of contemporary jewelry since 1969. He received his training at the Bezalel Academy of Fine Arts Jerusalem Israel, Fachhochschule fuer Gestaltung Pforzheim Germany and at Juhls Kautokeino Norway. Professor of Jewelry (and Enamel) Design at the University of Utrecht Holland; Head of jewelry and enamel department at the Art College Amersfoort Holland; President of the VES ( Dutch Jewelry Designers Organization) and lecturer at universities, colleges and art organizations internationally. 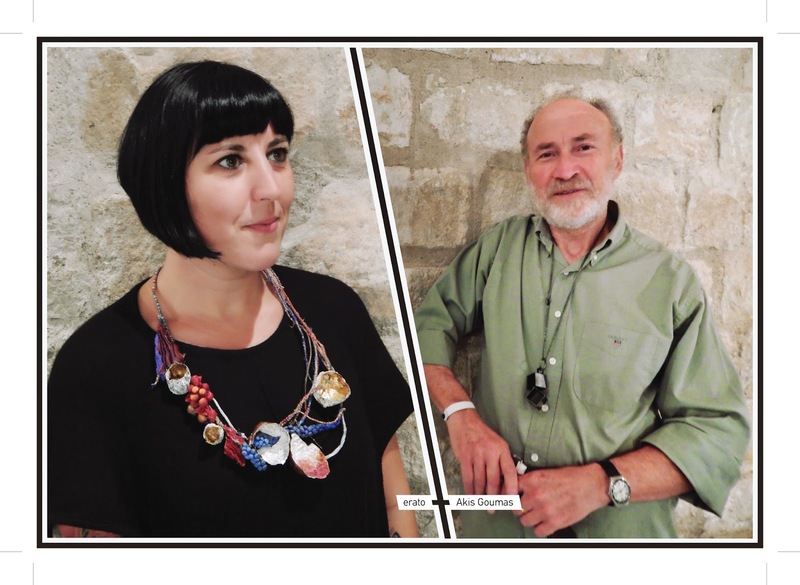 He also distributes books and catalogs in the field of jewelry/metal/design and his array of international titles are considered the most comprehensive in contemporary jewelry. He has been the official bookseller of the SNAG ( Society of North American Goldsmiths ) for the past 25 years. He has juried Talente and Schmuckszene in Munich for many years. Το Σεμινάριο που θα μας παρουσιάσει ο Charon Kransen, «Γράψε το Δικό σου Σενάριο», απευθύνεται σε καλλιτέχνες που θέλουν να ξεπεράσουν τα στενά πλαίσια των αισθητικών προτύπων που επιβάλλει ο μαζικός χαρακτήρας της εμπορικής παραγωγής και να δημιουργήσουν, βασιζόμενοι στο προσωπικό τους ταλέντο και τις ιδιαιτερότητες τους. Ταυτόχρονα, αρκετός χρόνος θα είναι αφιερωμένος στην βαθύτερη εξερεύνηση του εσωτερικού δυναμικού των καλλιτεχνών. Μέσω συζήτησης και ασκήσεων θα προσδιορίσουμε τα μεγάλα εμπόδια, συναισθηματικά κι ψυχολογικά, που οι ίδιοι βάζουμε στους εαυτούς μας, μπλοκάροντας την δημιουργική δύναμη μέσα μας και θα μάθουμε μηχανισμούς που θα μας βοηθήσουν να ξεκλειδώσουμε την δύναμη αυτή, ώστε να λειτουργούμε στο μέγιστο των δυνατοτήτων μας. ΔΗΛΩΣΕΙΣ ΣΥΜΜΕΤΟΧΗΣ ΜΕΧΡΙ 14 ΣΕΠΤΕΜΒΡΙΟΥ 2014. 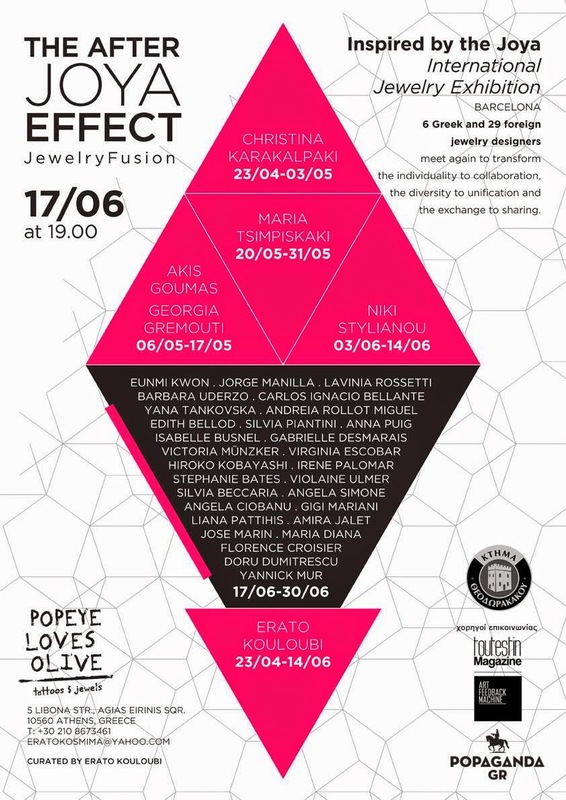 "THE AFTER - JOYA EFFECT"
Inspired by the JOYA - International Jewelry Exhibition in Barcelona, 6 Greek and 29 foreign jewelry designers, travel and meet again, this time at a new place, “Popeye Loves Olive” in Athens. The aim of this encounter is the interaction and the transformation of individuality to collaboration, diversity to unification and exchange to sharing. Paulo Ribeiro, Co-Director at Le Département, the organization of JOYA Barcelona - Joyería Contemporánea, will open the exhibition. 29 ARTISTS FROM 15 DIFFERENT COUNTRIES! Με αφορμή την Διεθνή Έκθεση Κοσμήματος Joya στη Βαρκελώνη, 6 Έλληνες και 29 ξένοι σχεδιαστές κοσμημάτων, ταξιδεύουν και συναντιούνται ξανά, αυτή τη φορά σ'ένα νέο χώρο, το «Popeye Loves Olive» στην Αθήνα. Σκοπός αυτής της συνάντησης είναι η διάδραση και ο μετασχηματισμός του ατομικού σε ομαδικό, της διαφορετικότητας σε ενοποίηση και της ανταλλαγής σε μοίρασμα. 29 ΔΙΕΘΝΕΙΣ ΣΧΕΔΙΑΣΤΕΣ ΑΠΟ 15 ΧΩΡΕΣ ΤΟΥ ΚΟΣΜΟΥ! Ο Paulo Ribeiro, διευθυντής του Le Department και οργανωτής της JOYA - Διεθνή Έκθεση Κοσμήματος στην Βαρκελώνη, θα προλογίσει την έκθεση. Looking from a different prism, Elisavet Kapogianni((garment) and Erato Kouloubi (jewel), find a common way apart from fashion. With a self-sarcastic mood, they meditate on the symbolism and the vanity of the garment and the jewel, as far as the decoration of the human body is concerned. 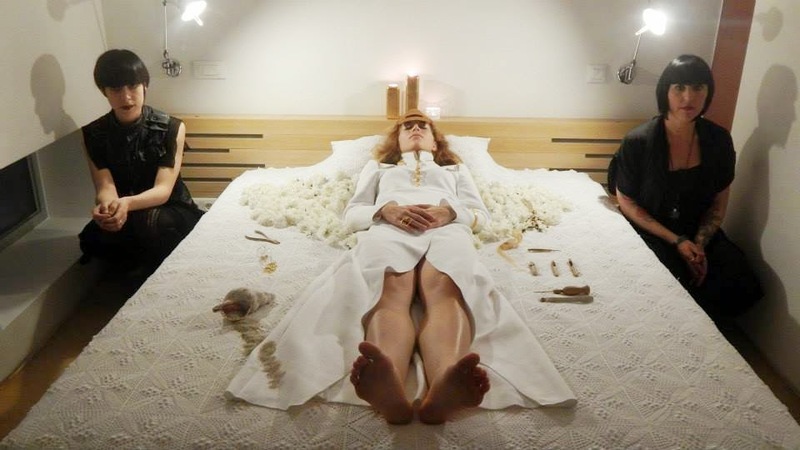 The project “Rites of Passage” is an installation in space, inspired from the ceremony of devolvement*. It is a trial to explore the semiotics of the garment and the jewel viewed as important relics of the world who is departing but also as necessary “passports” for the transition to another “state”, to a brand new world. After the “end” those objects reveal the human vanity but at the same time they symbolize a journey to a new beginning. A beginning that it is marked from this transition with only luggage what is highlighted every time as significant. *Ceremony of transition, ceremonial fact or object which signals the transition of a person from one regime to another. 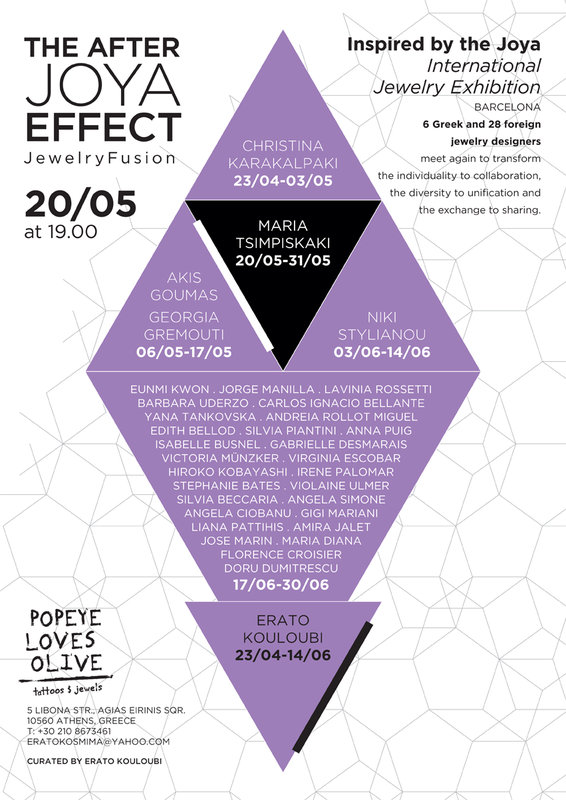 Inspired by the Joya - International Jewelry Exhibition in Barcelona, 6 Greek and 28 foreign jewelry designers, travel and meet again, this time at a new place, “Popeye Loves Olive” in Athens. The aim of this encounter is the interaction and the transformation of individuality to collaboration, diversity to unification and exchange to sharing. Christina Karakalpaki was born in Athens, Greece. Her architectural studies have given her the technical and aesthetic knowledge and skills to balance between the large and the small scale with agility, while at the same time feeding her curiosity in order to explore the spaces in between them. She has attended several seminars on jewelry design and micro-sculpture, she has participated in Greek and international exhibitions and her work has been featured in design magazines. 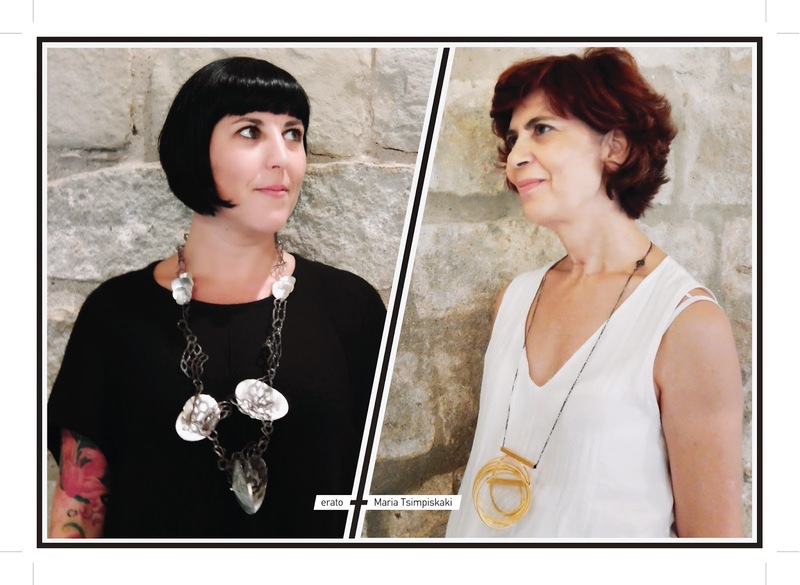 As a freelance architect she provides consultation to a Greek company that produces metal furniture and artifacts, while as a jeweler she has collaborations with museum art shops, local jewelry stores and galleries. 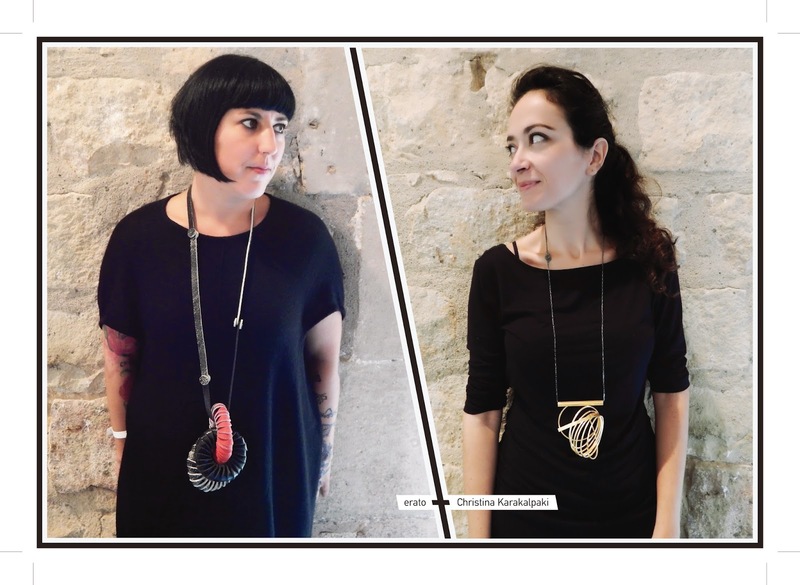 The last few years she maintains a workshop in Athens and her aim is to create jewelry that have a clear structure and that play an important role in complementing the body of the bearer. 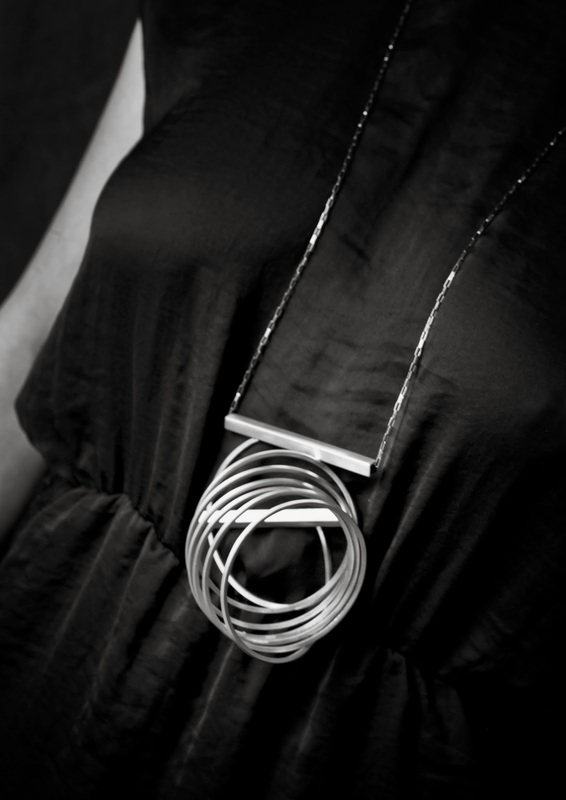 Architecture plays an important role in the way I think about jewellery and in the way I compose my pieces. The scale is the factor that changes. I believe that the micro scale gives me more freedom of expression, because it has fewer restrictions. I am truly fascinated by the microcosm of jewelry because it gives me a freedom of expression, the ability to have absolute control of what I create and why. Sometimes I act based on a specific drawing and others times I act intuitively, without having a certain image in my mind of the final result. I let the materials lead me and I often find myself positively surprised of how the completed project differs from my original intent. Many times I act intuitively, without having a certain plan or image in my mind of the final result. I let the materials lead me and I often find myself positively surprised of how the completed project differs from my original intent. Characteristic of my work is the strict geometric compositions and some collections are dominated by sharp angles and zigzags. 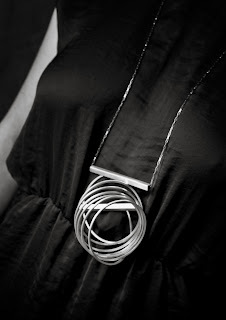 Other groups of jewelry are freed from the concrete architectural frame and consist of more curved forms. I am very interested in exploring the boundaries of materials and the various textures I can achieve on different surfaces, in using contradictory elements and also in inventing my own techniques of processing a material. What is really important to me is that my work has aesthetic integrity, consistency and purity in its structure, something that I try to achieve with constant experimentation and persistence. One of my latest collections has to do with my effort to handle a favorite and intimate to me material: leather. In my collection “Skin on Skin” I used different thicknesses and qualities of leather. The surfaces are either smooth or rough, either hand painted or printed with colored films. With its softness and lightness, one feels that the jewel follows the body discreetly, no matter how morphological eccentric it may be. The collection consists of colorful brooches and bracelets, leather chains with a different touch and multilayered necklaces. He teaches jewelry design for almost 20 years. He also works with a group of archaeologists researching the prehistoric metal technologies of the Aegean region. Classical guitar diploma at Athens Conservatory, studied Fine Arts Sculpture in Massachusetts College of Art, BA - 1998. Attended textile design courses at Central Saint Martins, 1987. Her work has been awarded in several competitions. 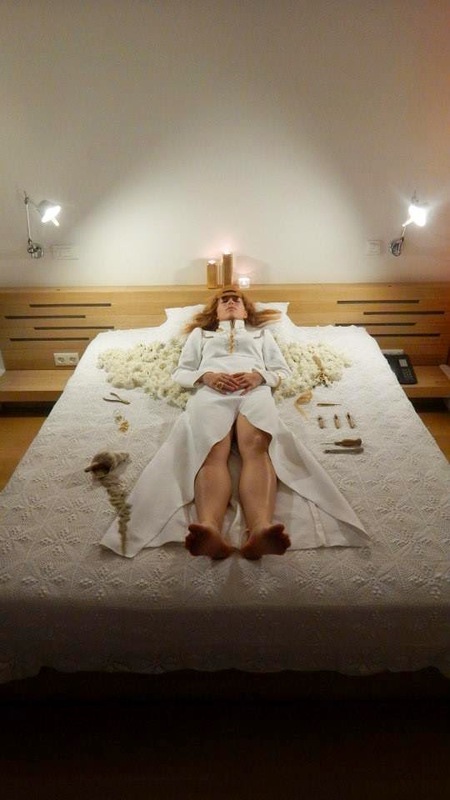 Her recent exhibitions were at the Benaki Museum, Athens, Greece, 2010, titled “False id”. The process of designing α piece of jewelry or an object is a journey in time. I follow a path through emotions, concepts and images. It is an ensemble of elements powered by memories, experiences and myths. My work is a medium through which I communicate with other people. I enjoy observing natural structures and studying prehistoric findings from the Aegean region with a group of archaeologists. 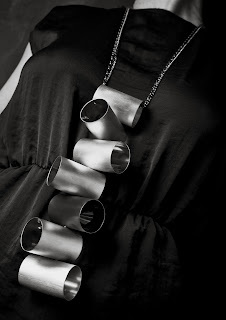 The pieces that I make are three dimensional compositions/objects, designed to be worn. Techniques, materials, colors and textures are the language through which I express myself during these journeys of creating. Maria Tsimpiskaki was born in Rethimno, Crete in Greece. She graduated from “Athens University of Economics and Business”. She is a jewelry designer since 1990 after attending painting, sculpture, jewelry making and design courses. She lives and works in Athens. 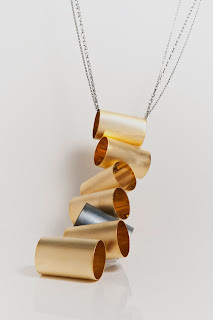 She thinks of jewelry design as a combination of lines, colors and materials that each time reveals a result of a given frame of mind, of different mental and emotional state. Finally the materials themselves, whether luxurious, or humble, complementary or disparate or ephemeral, worked by hand; using traditional and modern techniques they produce a range of unique pieces. Her aim is to create jewelry that are flawless in terms of construction and finish, perfectly fitting the human body so they become an essential and cherished accessory, setting off the personality of the wearer. She is a member of the international art jewelry community klimt02 and the Italian association of contemporary jewelry AGC και Gioiellodentro. She was born in Athens, Greece. She studied Architecture Engineering at the National Technical University of Athens. She completed her postgraduate studies at the Royal College of Art(MA 1994, School of Architecture and Interior Design, MPhil 1998, School of Communication Design and School of Humanities). She has also attended several courses and workshops on printmaking, painting, ceramics and jewelry. From 1994 to 2001 she worked in London as a freelance Architect and Designer. Her projects were multidisciplinary covering a number of fields between Architecture and Art. In 2001 she returned to Greece and formed the Architectural team L.A.ST., together with T. Athanassopoulos and A. Lapourtas. 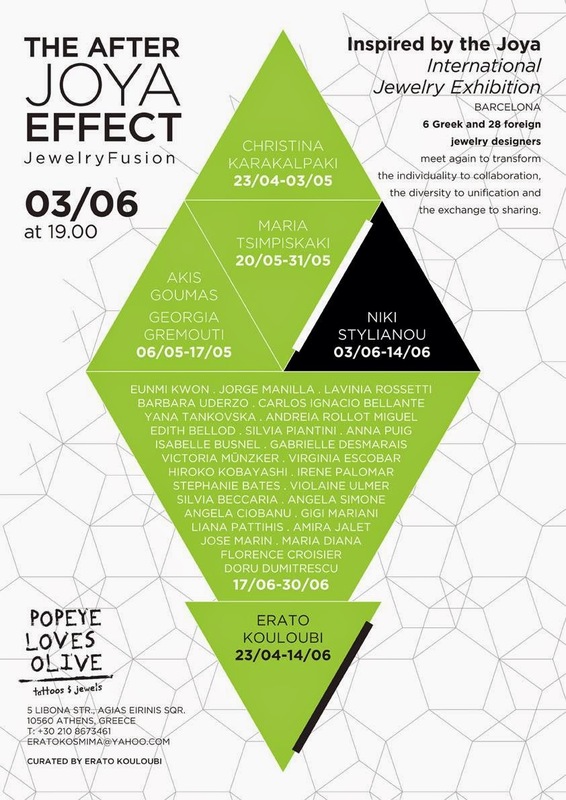 Since 2004 Niki Stylianou works as an artist and jewelry designer/maker. 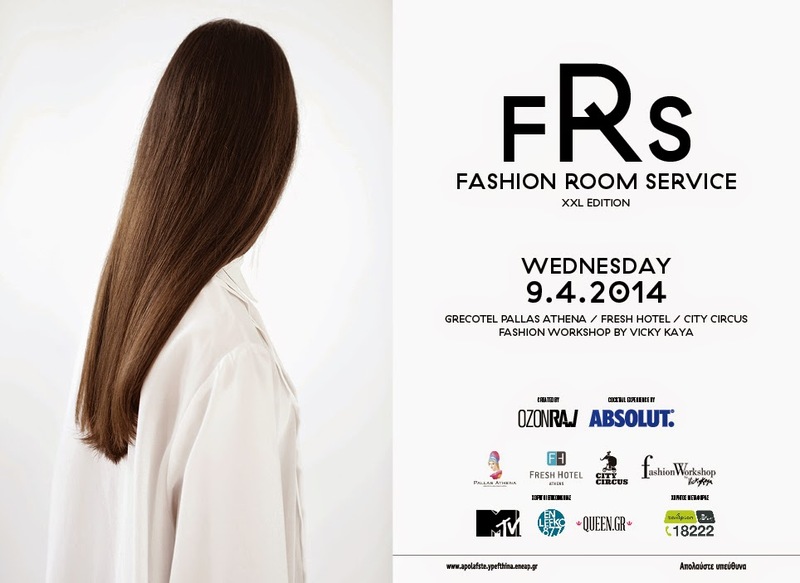 She has participated in several national and international exhibitions. The Ancient Greek word «kosmos» could be read as rhythm; as order; as the making of a pattern that could be traced again and again and be embodied in the cosmos as we understand it. In a way «kosmos» makes the cosmos visible. «Kosmos» could also be read as adornment. Homeric epics describe how «kosmos» clothes the body as a second skin to make it appear. Through her work, N. Stylianou, tries to redefine «kosmos», designing adornments made of ordinary and overlooked everyday objects. 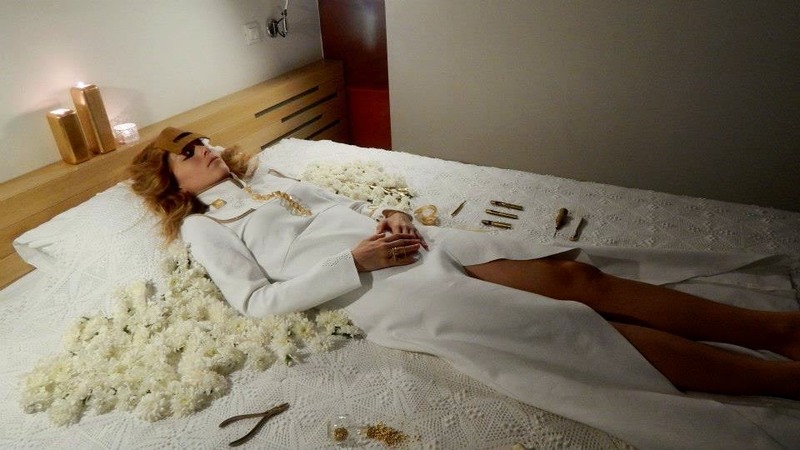 Things that she de-constructs and re-arranges in space/puzzles, that clothe the body while speaking of immaterial relationships: the precious and the non-precious; the beautiful and the ambiguous; the familiar and the unusual; the lasting and the ephemeral. Continuous themes are also geometry and exploration of pattern, texture and balance. In the following collections, the object chosen to be de-constructed and researched is the rubber glove. Rubber gloves are thus washed several times until they become odor free, they are hand cut, hand painted, stitched, fabricated and mixed with precious and semi-precious materials. The resulting work is elegant and well-crafted with an underlying sense of humor. Τι είναι σύγχρονο και τι είναι αρχαίο; Τι ανήκει στο παρελθόν και πώς δημιουργείται το μοντέρνο; Η έκθεση σύγχρονου εικαστικού κοσμήματος “Το Ενώτιον” παίρνει την αφορμή από τον πλούτο της αρχαίας ελληνικής κοσμηματοποιίας, δίνει έμφαση στα σκουλαρίκια και ξεκινά ένα δημιουργικό διάλογο με την ιστορία. Στην έκθεση συμμετέχουν οι μαθητές του εργαστηριού Άναμμα και οι καθηγητές τους που σχεδιάζουν και κατασκευάζουν τα σκουλαρίκια τους ως μια προσωπική απάντηση στα παραπάνω ερωτήματα. Αναστασία Αγγλοπούλου, Αμέρισσα Αποκρεμιώτη, Αγγελική Γιακουμάκη, Κατερίνα Γλύκα, Ιωάννα Δημητρακοπούλου, Ευαγγελία Δημητρίου, Κατερίνα Καλλιβρούση, Λίλη Κανελοπούλου, Πένυ Κομβοτέα, Χαρά Κουρταλή, Άγγελος Κωνσταντακάτος, Λαβίνια Λάσκαρι, Αγγελική Μάδη, Εμμανουέλα Νικολάου, Υακίνθη Οικονόμου, Κυριακή Παναγή, Άννα Περβολαράκη, Φωτεινή Ρόζη, Ελένη Ρούμπου, Ειρήνη Ρούσσου, Kaia Saarna, Έλενα Σίμου, Δωροθέα Σταματοπούλου, Anna Fatovich, Δάφνη Φικιώρη, Χρύσα Χατζηκωνσταντινίδου, Κατερίνα Χρυσόγλου, Νικόλας Ψυχογιός. Ιωάννα Ανδρίτσου, Δήμητρα Δάρρα, Αλεξάνδρα Μόσχου, Άντρια Πρασίνου, Κωνσταντίνα Χάχαλη. Αναστασία Κανδαράκη, Όλγα Κανδαράκη, Δημήτρης Νικολαϊδης, Ευάγγελος Παπαποστόλου, Γιάννης Σιώτης. Εγκαίνια: Παρασκευή 28 Μαρτίου στις 7μμ. 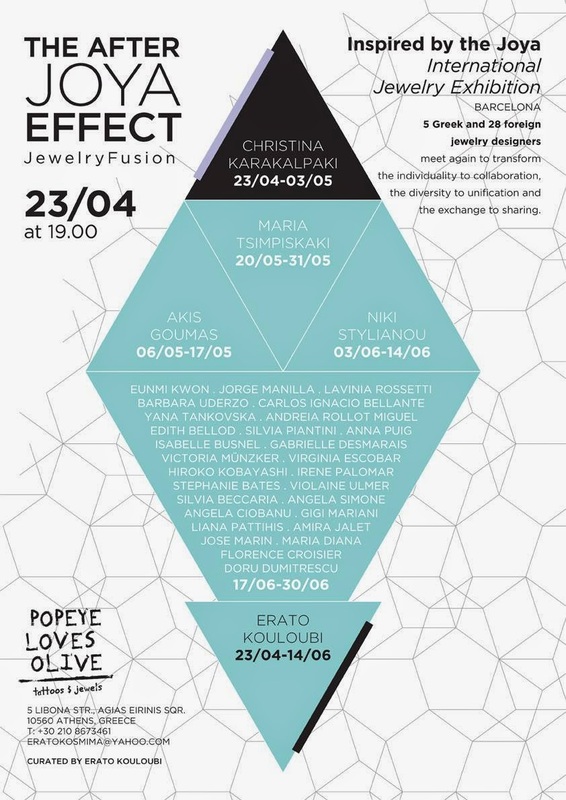 Exploring the art of jewelry, erato graduated from Mokume(Jewelry School Athens). She specialized in Chemical Coloring and Patination of Metals in” Camberwell College of Arts “ and Manipulating Glass in “St.Martins College” London,U.K. In the meantime, she worked with the jewelry designer Yen Duong in Cockpit Arts Center. Returning to Greece she creates her own studio. Through her work she was established in handmade jewelry art. 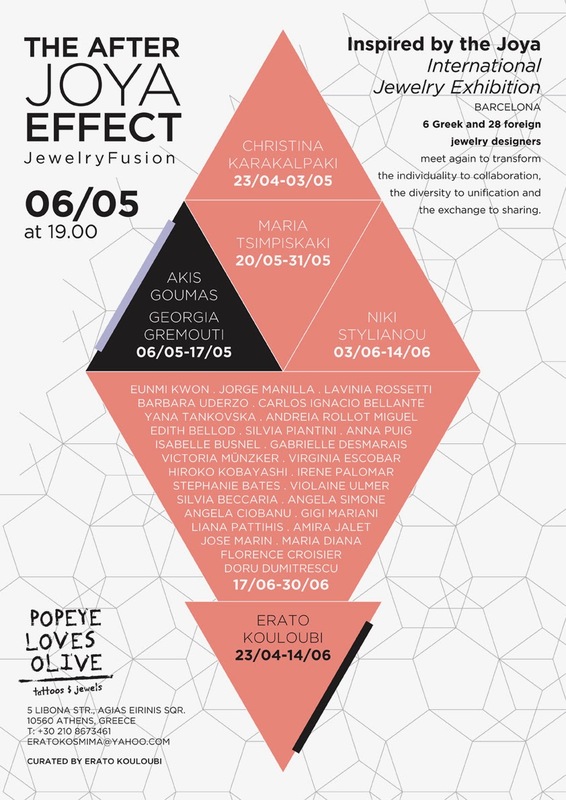 Her creations were exhibited in : Sierrad,,Amsterdam, Handwerk & Design,Munich, ”The Arch Window”London,U.k, “Joya”,Barcelona, metamatic:taf, Marnery Creative Gallery and Apotheke gallery in Paros,Greece (artists in residence). Her work is hosted in selected stores, Benaki museum and ” Popeye Loves Olive “, her own store which she recently opened with the tattoo artist Gianni Barouxi-Paroxysm Tattoo.